Here are the basics to have those search giants pick up your blog and rank it on the first page! Keep these tips in mind when creating your posts so you have to spend minimal time going back and editing them. It’s part of the reason how I grew my blog from $0 to over $20,000 per month. SEO is a slow process, but it helps your blog rank higher in Google and also makes it easier for others to read your blog. Think of SEO like an organizational system for your blog. 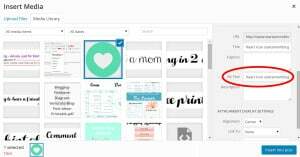 It doesn’t make a big difference in the beginning, but as your blog grows, keeping everything organized and properly tagged makes it easier for Google and others to find your blog. And the more people find it your great content, the more they’ll backlink to you, and these links back to your blog also ranks you higher. Because it tells Google that other people like your content too! Decide which long tail keywords you want to rank for in each post. Optimize the post to include those long tail keywords. Example of a long tail keyword: Frugal Living with Children, instead of just the keywords ‘Frugal Living’. Trying to rank for long tail keywords is easier than ranking for the higher level, less descriptive keywords. 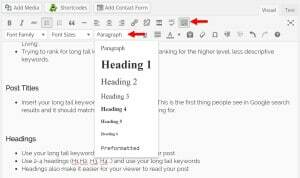 Insert your long tail keywords into your post titles. This is the first thing people see in Google search results and it should match what they were searching for. Your meta description is the few sentences of text shown under the main title link in a Google Search. Use your keywords again in your meta description. But don’t over stuff it. Always make it sound natural but enticing enough to have the person click through to your site. Make sure you have related posts under your article. This will help direct readers where to go next and keep them on your site longer. Create links between your posts. This will show Google you have more authority on the subject and help boost your rankings. It will also keep viewers on your blog longer and create sticky traffic. Make sure your images have ALT text. This makes them searchable for Google and they could show up in a Google image search. This could drive more traffic to your blog. The search engine can not view your images, it can only read the ALT text. Use the right format whenever creating anchor text, either on internal links on your site, or on other websites. Your anchor text should be descriptive of your post, and not a “Click Here” link. Do this: Find more way to increase traffic to your blog. Do not do this: Click here to find more ways to boost traffic to your blog. These are links from other sites that link back to your blog. Write amazing content and other will link to it from their sites. Guest posting on bigger blogger’s sites will give you a few back links to your blog. Also, the nicer and more active you are on the blogging community, the greater your chances are of other bloggers back linking to your blog. This will boost your SEO because Google sees your blog as an authority in your niche when others back link to you. This is super important for SEO ranking! Yoast SEO is a great plugin that guides you through optimizing every post for SEO. It even has little lights (red, yellow, green) to let you know how you’re doing! SiteGround, the hosting company I use for all of my blogs, has the SG Optimizer that speeds up your site and optimizes it. The quicker your site loads, the higher you rank in Google, and the less people click away. Slow sites have high bounce rates, meaning that people don’t stay on them for long. SG Optimizer does dynamic caching and increases the performance of your site. It’s available to customers of SiteGround’s GrowBig plan – the plan I started my blog with from the beginning! Have pretty permalinks. This helps Google rank you for the right key words. 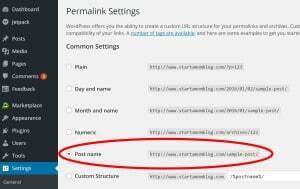 Here is how to change your permalinks easily in WordPress. Go to Settings > Permalinks and change it to Post Name. Setup your site with Google Search Console to make it easier for Google to find you. Here are more reasons why you need to set up your site with Google Search Console. I’ve found a few things that play into being featured on the Google Snippet. It’s all the same things that help you rank higher in Google overall, but below are the key factors. Make sure your blog post is detailed and has great headings for each of the steps. “How to” articles are great for this! Google can then easily grab the steps from your post to show them in the featured snippet. Keep your readers on the article for as long as possible. The longer someone spends on your post, the more Google sees it as important. So make sure to offer all the steps needed to complete the action from point A to point B. 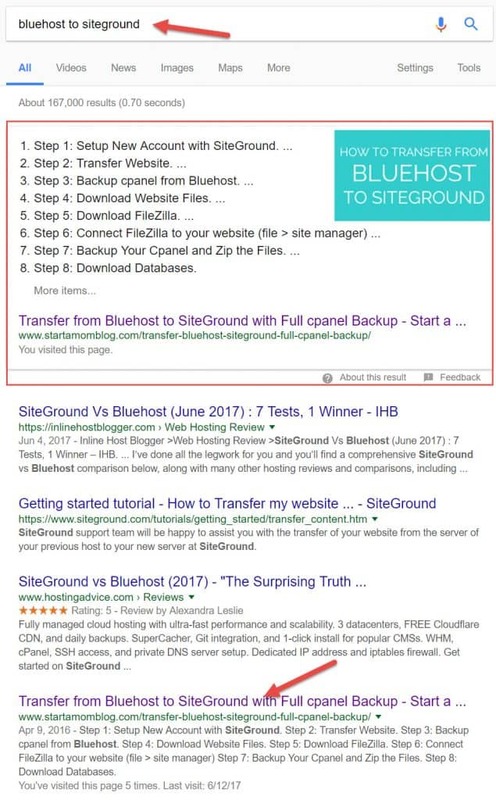 That is why I believe my post for transferring your site from BlueHost to SiteGround does so well – because people keep the post open as they go through each step to transfer their blogs – and this can take up to hours to do. Have a high click through rate. The more people click on your link, the more Google will like your blog. So use a catchy headline that uses the same words as your reader uses when they search for your information. 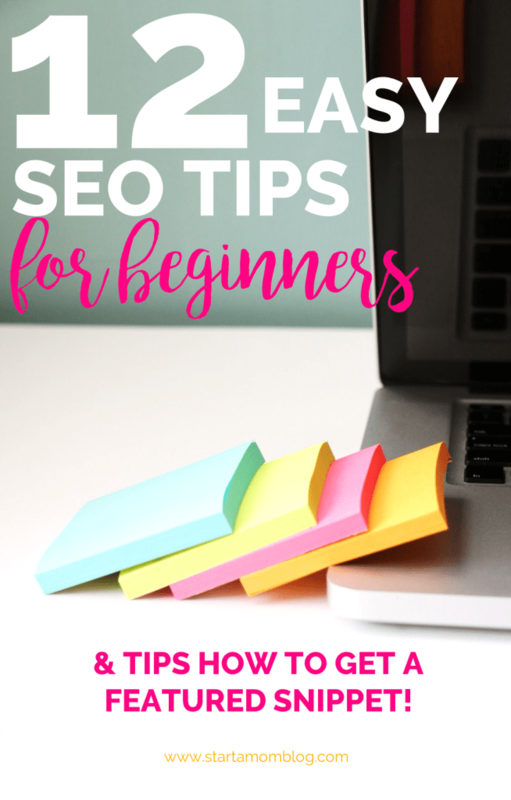 Mommas, I hope this has helped you understand the basics of SEO and given you quick tips to rank higher! Need to know how social media to grow your blog traffic, or just more fantastic tips to increase traffic to your blog? Or see the Blog by Number step by step course to help you start your successful blog. Over 1,000 students have taken it! Please include attribution to TheSavvyCouple.com with this graphic. Can you tell me more about Google Search Console? I just verified my website following the link you provided but can you help me understand what this does for me? I read through some info on the site but my brain is not processing it. Good read you’ve got here. An awesome resource, worthy to read. I do agree that you need to create a goal in order to grow your blog traffic. It’s good that you mention about long tail keywords here. You actually showcase all the aspect that need to be within a blog even the featured snippet. This resource is of great help. This is truly the most helpful article I’ve read on SEO! Thank you so much for sharing all of your wisdom, bookmarking and will be coming back for more! I am very excited to start my blog! I’ve been binge reading your articles and learning so much. The explanations are easy to comprehend.